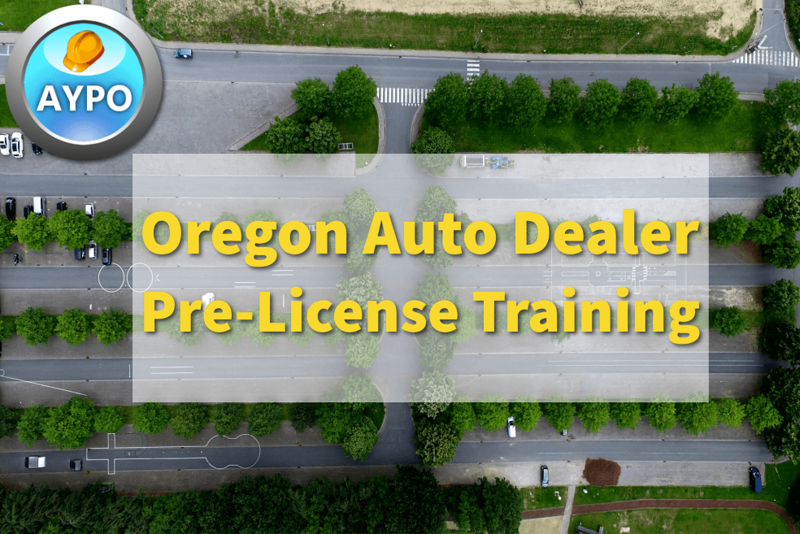 This course will satisfy all Oregon pre-license education requirements in order to obtain your Oregon dealer license. This course is approved for pre-license education. Upon payment, you will gain instant access to your classroom. Upon completion of the course, you will be able to print your certificate of completion. Register with Online Auto Dealer Ed and start your online, 8 hour, State mandated course instantly for only $120.00. Complete the Oregon DMV Auto Dealer Application. We provide this application in the online classroom. Provide your proof of course completion (certificate), the Oregon DMV application and proof of insurance and bonding to the DMV. Fácil de entrar y aser el tes. it was a great course, easy to follow and well organized. Very impressed with the amount of information provided in an easy to read and navigate form. Glad it is not timed and I could really take my time and read everything a number of times in order to really understand the information and sometimes go back and read it again until it really sinks into memry and I can certainly say I know what it is all about when it comes to any category covered in the course. Loved the exam questions. Made me go back and review a number of lessons by being such detail oriented. Definitely a great course and would recommend to anyone! Great class very easy to navigate through. This was an awesome site to use, will definitely be back for my continuing education. very easy to follow along, great information. This course is very informative. There were a few instances of grammatical or spelling errors occurred. Question 15 has the same answer listed for two responses. Enjoyed the re-fresher, been doing auto sales since 2008 and the course was a good re-fresh to the Brain. Very easy format to follow. Thanks for making it easy. It was good! I learned a lot. I really enjoyed the course, I learned a lot from going through the full course. Being honest, I will have to say the pre-test were nothing like the final exam. But happy to say, I passed! Thank you for having this course online, everything was at my own pace. love the setup, easy to use. Great course. Very well organized. Great test that can be done on your own free time. Thank you for a well organized and thorough course and exam. Well done. Worth the time. it was great and clear. It was good, but little bit hard. Great course that fits your schedule by being able to stop and start on any device at anytime. I found this course very helpful and would recommend this to anyone trying to get into the Car business! Well layed out, easy to follow, and it keeps good track of where I left off each time I exited the program. I like how I really could go at my own pace. When I had time I was able to log in and go for it. Thank you! I look forward to the other help you provide! I learned a lot! I am ready! This is a really great course! It is very informative and easy to understand. Very in depth and detailed. Incredibly informative and very nice to be able to work at your own pace. This course was great easy and simple. This course was informative, straight forward and very helpful. I would recommend it to anyone needing to take this course. The material is highly detailed, informative, and presented in a very professional format. It was very informative and helpful. lots of information. i give two thumbs up. Detailed & easy to follow information. This course was straight to the point! and concise and informational! I would definitely recommend it! I liked my own pace, easy to navigate, informative. very efficient and good course! Great course. Covered everything I could imagine needing. Good job! Thank you, At Your Pace Online, LLC, your course was useful and educational. (2) questions were not in sequence with informational reading material. Great explanation of the course! This was a great coarse, and allowed me to perform at my pace. It was very easy to use at your own pace. There were links throughout the course and none of them worked. Also, based on other At Your Pace courses, I thought there would be videos and slideshows. Good information. Some was very repetitive. more video would be better. Would've liked to have a bit more information or examples on some of the subjects touched in this course. For example, when requesting exempt on a location of a business. It would be nice to have some information as to what would be considered an appropriate exemption. A lot of information to remember for the quiz. It was very simple, had the info I needed. If anything I think it could have been more challenging. A number of typo errors in wording. Always room for improvement but very informative all around. This course was easy to complete at my own pace. REALLY GOOD COURSES, EASY TO UNDERSTAND THANK YOU. The course has a lot of unnecessary information for dealers, it would be nice if there was a clear section on what dealers need to do to go through a transaction, and all the documents we need to use. However, it was pretty quick and easy, I just feel like I didn't learn the essentials. I think a lot of these questions are worded to be confusing. Answers such as: Both of these or Either of these??? Those are the same thing. The information was solid, but it would be great if you could break up the information with videos. This program is completely text, only the intro and summary are videos which may work for some people but I feel like I could have just looked up the information and passed the exam. I learn a lot better from having some kind of visual and if you are like me you should find a different class. I might as well have read a book, this course was basically just information out of a book on different pages. I understand that it is the basic information to pass the licensing requirements for Oregon, but it could have been laid out much better. We will use other companies for future continuing education. There are many instances throughout the course where words are mis-spelled or where typing and grammatical errors make the materials very hard to follow. Poor grade for lack of attention to detail. You claimed you provided videos for teaching, but really you just threw the intro and conclusion videos in so that you could make the "video" claim. Kinda Sketchy.